1 trillion American dollars – does it sound impressive? Sure it does, and that’s the amount of money that financial analysts expect from artificial intelligence to save for the banking domain by 2030. Sure enough, these predictions aren’t worth a thing if bank clients aren’t satisfied with the level of AI customer service. As a matter of fact, the financial industry was one of the first to appreciate the benefits of artificial intelligence and welcomed them with arms wide open. The annual budgets of some of the largest banks reach billions of dollars, which is comparable to the state budgets of some developing countries. The way that large banks act has a significant impact on the shares value of leading technology companies around the globe as they use banking services on a daily basis. By 2019, the largest and most successful banking institutions have already developed official AI strategies, and many of them have their own AI departments. According to the forecast of the research company Autonomous Next, by 2030, banks will be able to reduce costs by 22% using artificial intelligence technologies. Meanwhile, there’s a serious problem for banks: the shortage of experienced AI developers and data processing professionals. This lack of personnel is a painful obstacle in the development of technology for the financial domain. Another breakthrough technology worth mentioning was the development of public and private cloud computing platforms. I mean that now they are reliable enough to work with sensitive financial information. Artificial intelligence has launched a new wave of applications and services in the financial market. AI can handle unstructured information: images, video, audio, location and time series data. There are already solutions which can detect fraud, assess credit risk, and identify a person via the use of artificial intelligence. In the insurance sector, they serve to identify insurance fraud, automate claims for insurance claims, identify risks and assist clients. With the help of AI, bank institutions increase the quality of customer service and the mobility of users. For instance, chatbots which inform and serve customers in real time. JP Morgan uses artificial intelligence to automate the analysis of loan agreements. In 2017, the bank introduced the Cointract Intelligence platform (COiN), which makes possible to analyze such type of agreements, putting in the spotlight the key conditions and key data. It worth saying that this solution helps to save up to 360.000 man-hours. The same year, Wells Fargo announced the creation of a special department of artificial intelligence, which will be engaged in payment technologies and improvement of services for corporate clients of the bank. The Bank also published an article on the use of AI in the field of security, in which it announced the possible start of research in this area. Bank of America launched Erica, a virtual AI assistant embedded in their mobile app and ATM network. 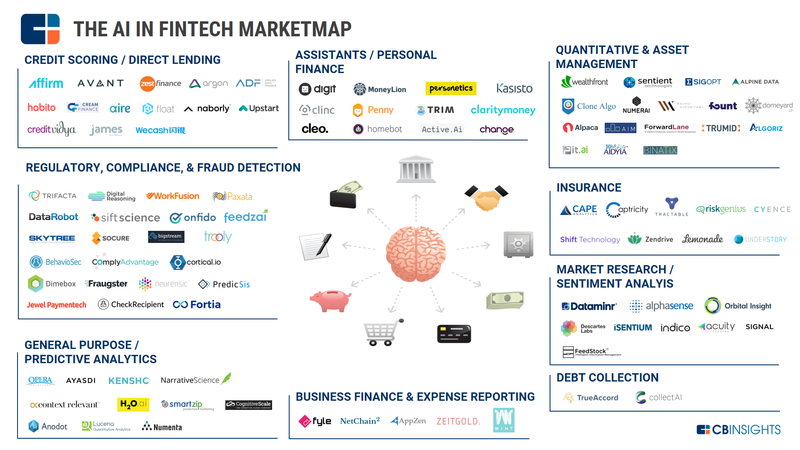 Citibank has made several investments in artificial intelligence companies. For example, in the project Feedzai, which uses AI to detect fraud and combat it in online banking. Another investment target is Clarity Money, which helps customers choose suitable financial products and manage their finances. Undoubtedly, the financial services industry is also attractive for startups for apparent reasons: some of them want to make a revolution in traditional banking, others want to help banks improve their products with new advanced services and everyone wants to earn a big buck as the industry is rich. There are several key areas for startups in the financial sector: fraud detection, consulting services, personal finance management, transaction assistance. Funny enough, but AI is a powerful tool for fraudsters themselves. It’s like a knife, totally depends on the way individuals use it: using it, you may threaten and then robe a person or peel off an apple for a child. Comparing the customer’s consumer behaviour with a huge array of historical data, you can find the smallest details and prevent fraud in advance. AI tools are constantly being trained and updated as they accumulate data with which they work. Consulting services — for example, consulting robots — can reduce risks for clients through a variety of information sources by recommending suitable financial products and objects for investment. And, surely, the article wouldn’t be complete without mentioning the blockchain technology. And nevermind the irony – the blockchain is an excellent solution in terms of providing financial data transparency and traceability. Besides, the technology protects users’ private information via its zero-knowledge proof solution. When needed, it doesn’t extract all information in the banking system but keeps on searching only for the relevant information anonymously. This way, the data extraction process becomes thrifty and it secures the banking system on the whole.